Well here we are at Monday again. Did everyone have a good weekend? I had a pretty decent one myself. I never get as much done as I want to, but hey that’s life. Friday night Benzo and I went out for a pre-race meal at Fazolis. This has become our traditional meal the night before races. We started it last year when we were training for the half marathon. We found that Fazolis is just the right amount of food and the dishes there don’t upset our stomachs the next day for racing or long runs. At other Italian restaurants I tend to overeat and therefore end up miserable. Fazolis is great because they have smaller portions. However I do have to watch the all you can eat breadsticks. It’s easy to fall into that mine. Saturday morning the race started at 7:45am. So we were up at 5:30am, eating breakfast by 5:45am. I like to eat two hours before gun time. I almost always eat toast with peanut butter and a banana before a race. If I’m running a longer race I’ll eat two pieces of toast or something more caloric like a bagel. But it’s usually some sort of bread with peanut butter and a banana. We did the 10k at the inaugural Rock the Parkway race event. There was also a 5k and a half marathon. The race was extremely well organized for being an inaugural event. We got a close parking spot and there were plenty of port-a-potties. I used them three times before the race (racing makes me nervous, which makes me have to…you know). Our parking spot was so close that I was able to warm up with extra clothes on and then dump them in the car before the race. Which leads me to the weather. It was not very warm. Probably mid-30s to low 40s I think? I wore capri length tights, and a long tank under a long-sleeve dry-fit shirt. I also had on gloves and an ear warmer headband. After I warmed up I was actually fine temperature-wise, until it started raining. And it kept raining. Throughout the entire race. Cold, drizzly rain. Ugh. My goal was to run under 50 minutes for the 10k. I wasn’t sure I would be able to do it in the cold rain, but I did! I ended up in 49:48. Whew! I felt pretty strong the entire time and actually ran the second half faster than the first half. I really liked the course and since the event was so well organized, I will definitely do this one again next year. My only complaints were that the mile markers were a little bit off, which threw me off mentally a bit. And they didn’t have the 5k marked, which would’ve been nice to know my split. And at the end they had tons of great food including hamburgers – but no veggie burgers. 😦 Race director, if you read this please offer some veggie burgers next year! After the race I was freezing, not to mention soaking wet so we hauled it home as fast as possible. A hot shower has never felt that good. After the shower I was tired and sleepy so the rest of the day was spent napping and reading. I finished reading The Lightning Thief (Percy Jackson and the Olympians, Book 1) , which was a really good book! If you are looking for an entertaining, easy read I highly recommend it. 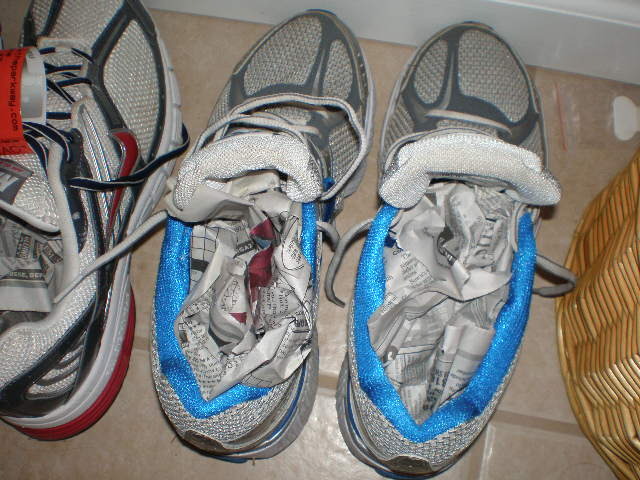 Side note: If you ever run in the rain and come back with soaking wet shoes, the best way to dry them out is by stuffing them with newspaper. The newspaper will absorb the moisture and they will be dry in 24 hours. Then you can use the newspaper to clean your mirrors or windows or recycle or compost it. We did not make it out to the Local Food Expo on Saturday. I was disappointed, but we were so cold from the race that there was no way we could stop by on the way home. And once we were home and warm, it would’ve taken a lot for me to go back out of the house until later that evening. Saturday night we went out to church and did a little shopping. Then when we got home we participated in Earth Hour. We were a little late, so our Earth Hour was from 9-10pm, but that’s okay. We turned off all the lights and played Skip-Bo by candle light. Benzo made an interesting comment that if we did that once a week for an entire year, it would be like going two full days without the lights on. Something to think about. Sunday I spent the morning cleaning. Then we went out for errands and grocery shopping. 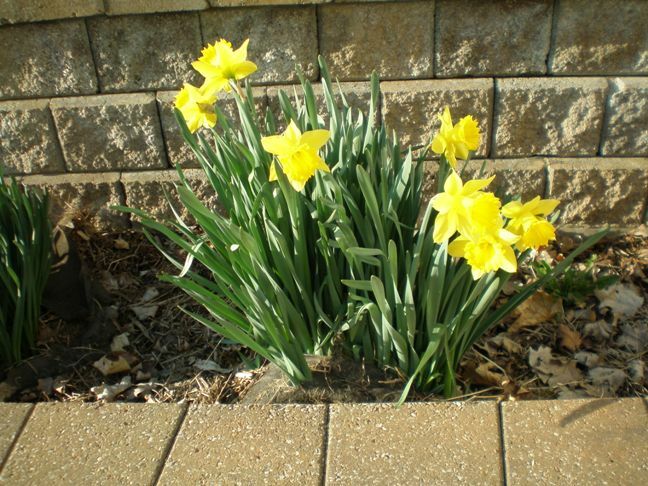 When we got back it was a lot warmer and the daffodils were looking really pretty. I also finally got my camera back! Benzo had left it at his office all weekend, so we stopped by to get it while we were out on Sunday. 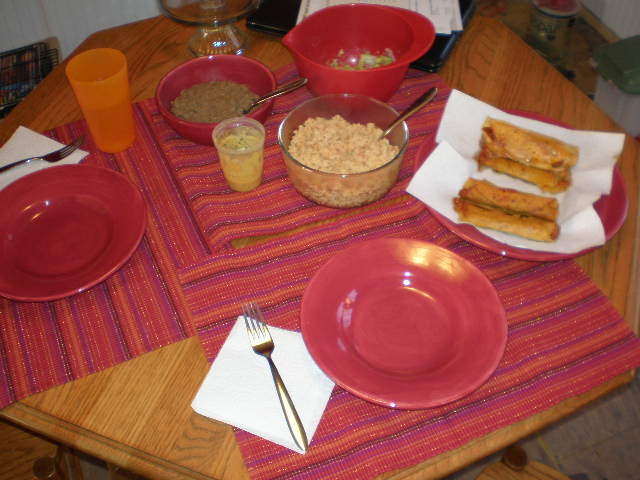 We decided to make a Mexican feast for dinner. Actually Benzo made most of it while I did laundry. 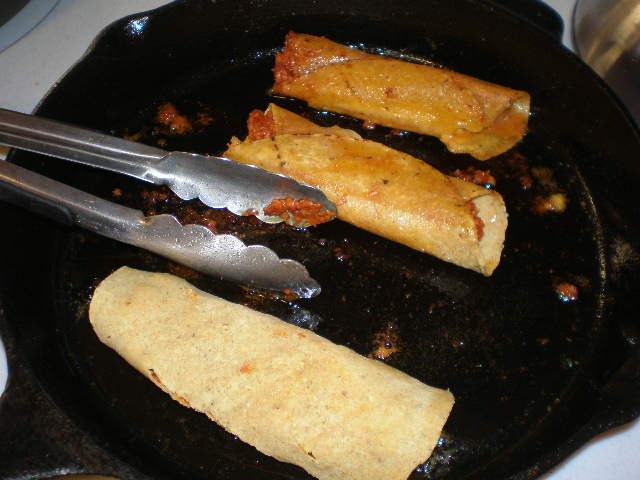 At the store we bought some Soyrizo and corn tortillas, so Benzo made fried taquitos. 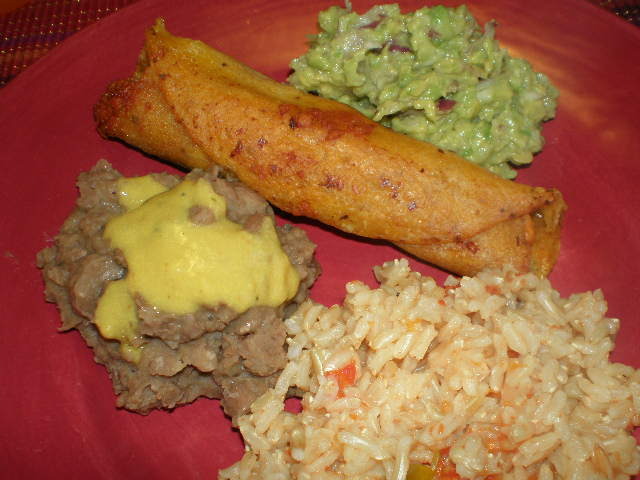 Soyrizo is really good. You can’t tell it’s not meat at all! However it’s pretty processed so we only eat it now and then. We also made spanish rice by cooking up some brown rice with chopped frozen tomatoes (from the garden last year) and 2 chopped pickled sport peppers (also from the garden last year) added to the cooking water. 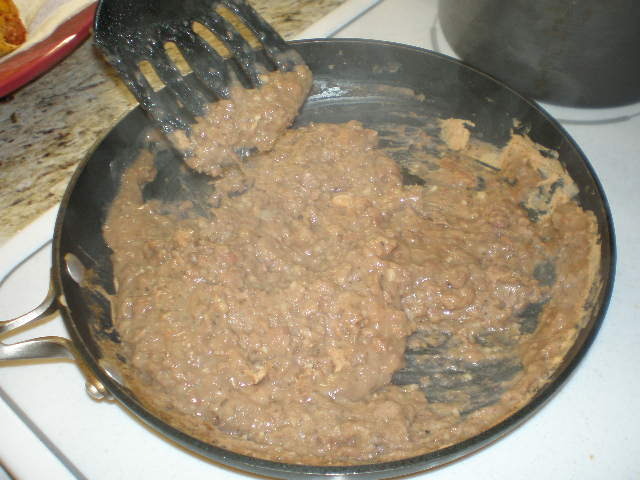 Then we had some leftover cooked pinto beans from last week in the fridge, so Benzo took a stab at making refried beans. He basically drained off some of the liquid, then mashed them up in a bowl with a potato masher. He stirred in a few spices like garlic and salt and pepper and then cooked it in a skillet with a little bit of oil. A little disclaimer here. 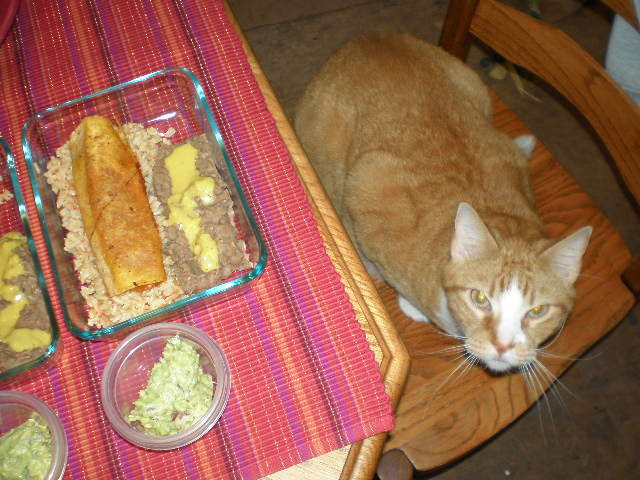 We don’t always eat at the dinner table. We actually have a very bad habit of eating in front of the television. I would very much like to break that habit. I poured some leftover cheezy sauce from Veganomicon on top of my beans. Delish! 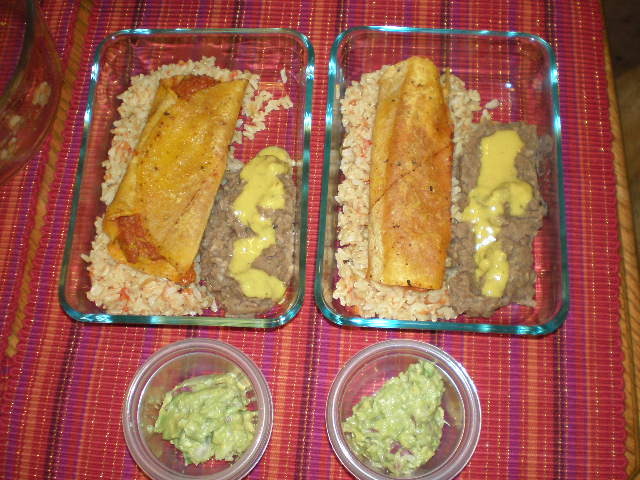 After dinner was over I packed up the leftovers into containers for our lunches today. The square glass containers are little Pyrex casserole dishes. I LOVE them. They are perfect for leftovers. After dinner we relaxed for a bit, but it wasn’t long before we were jonesing for something sweet. 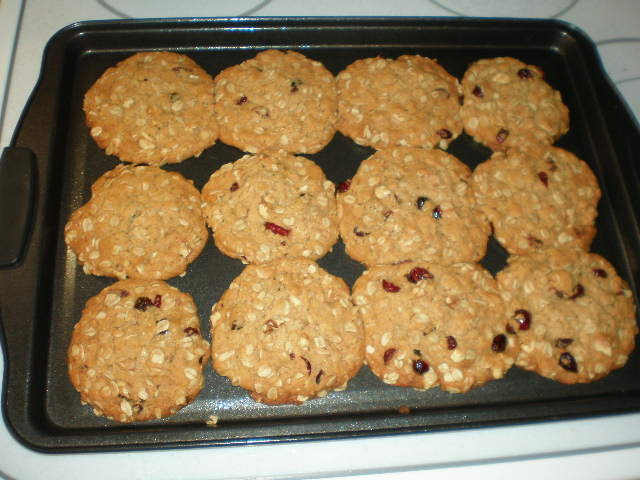 I decided to make the Plum Walnut Cookies from The Kind Life. I used dried cranberries instead of plums. These cookies expanded like crazy! They were all running into each other. I wish I had a “before” picture so you could see the difference. And they turned out really delicious. 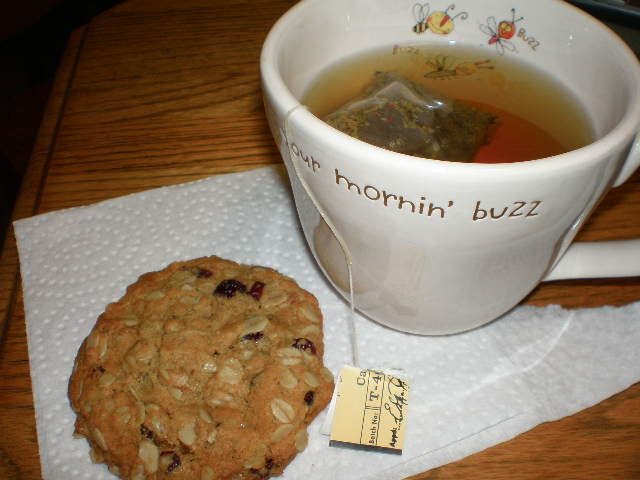 I enjoyed one with a cup of chamomile tea. All in all it was a great weekend. This week the weather is supposed to be gorgeous here in Kansas. 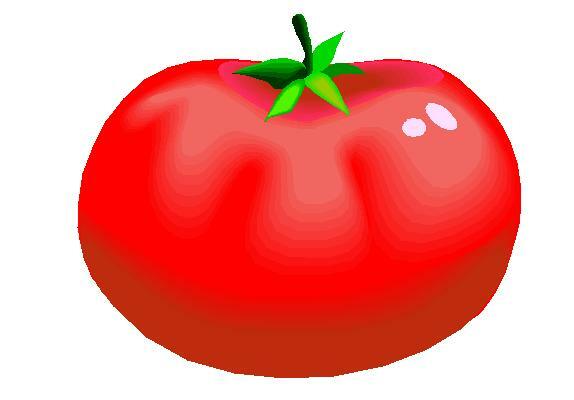 I’m looking forward to working in the garden a lot and getting more seeds planted. Hopefully I’ll have more pictures to share! Those cookies look amazing! Recipe please? Nom, nom, nom indeed!